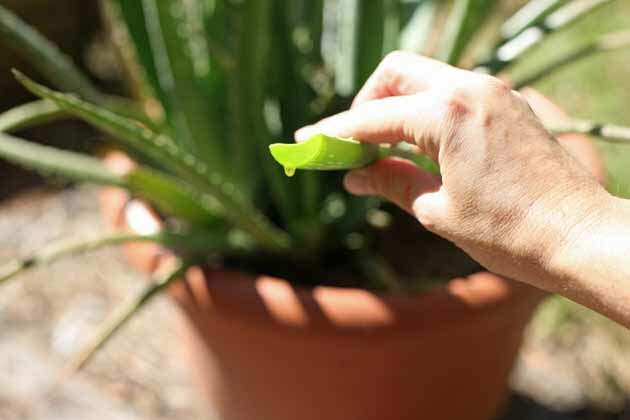 In this post, we will go over everything we need to know about Aloe Vera plant care and uses. We’ll talk about where you can get, plant, care for, harvest, and use aloe vera. If there is one plant you should grow no matter where you are or how much space you have or don’t have, it’s Aloe Vera. They say a dog is man’s best friend, I say it’s actually Aloe Vera. With all due respect for dogs (and I have a lot…), this plant requires almost no care, it doesn’t poop or drool, and it’s going to save you on a regular basis. Aloe Vera is a succulent plant, meaning it stores water in its leaves (it is 94% water). It grows up to about 36 inches tall and spreads outward by offsets or “pups” (picture below) to form a wide cluster of chubby leaves. Aloe Vera is native to Northern Africa. The green (or grey-green) leaves are thick and fleshy with tiny white teeth on their margins. The “teeth” can scratch, but are not as bad as thorns. There are almost 300 identified species of aloe vera. 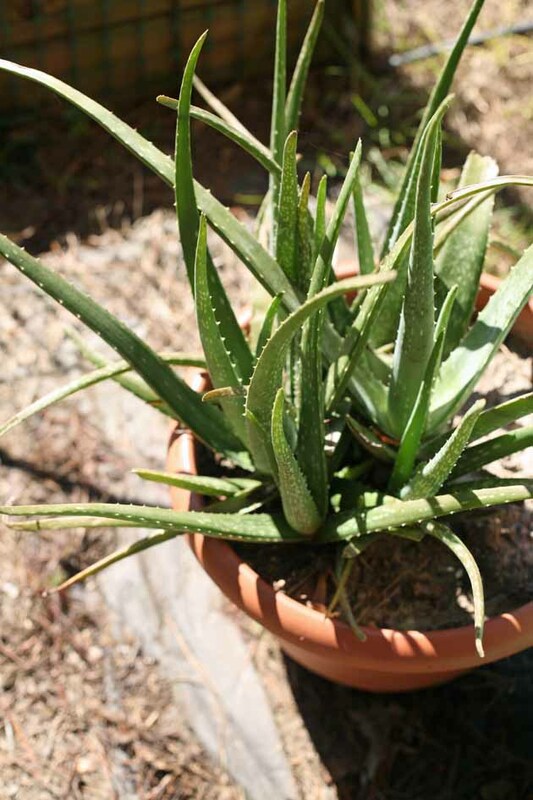 Medical aloe vera can be recognized by the faint white spots on the thick leaves. 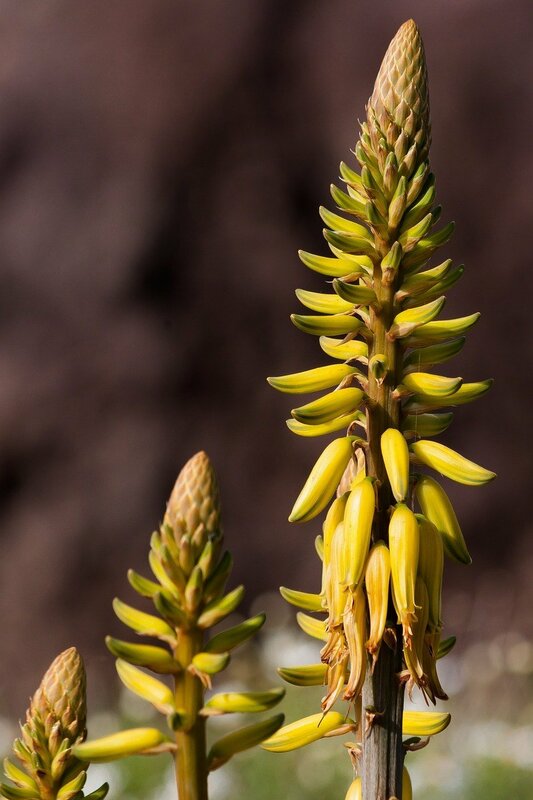 In the desert, aloe vera will produce a flower stem in the spring. It grows from the center of the plant and is 2 to 3 feet tall and topped with tubular pink or yellow flowers. Where Can I Get an Aloe Vera Plant? I got my aloe vera plant six years ago from my soon to be ex-mother-in-law after she removed some offsets from her mother plant. If you have a friend or a family member that happens to have it growing somewhere, you can propagate it by removing an offset. I’ll explain how to do this later in this post. Your local plant nursery should have aloe vera plants. You might even be able to find it in the farmer’s market. And, of course, like everything else, you can find it on Amazon. Outdoor – if you garden in zones 9-11 you can plant aloe vera outdoors. If you are planting more than one plant, make sure to space them 3 feet apart since your plants are going to spread outward. 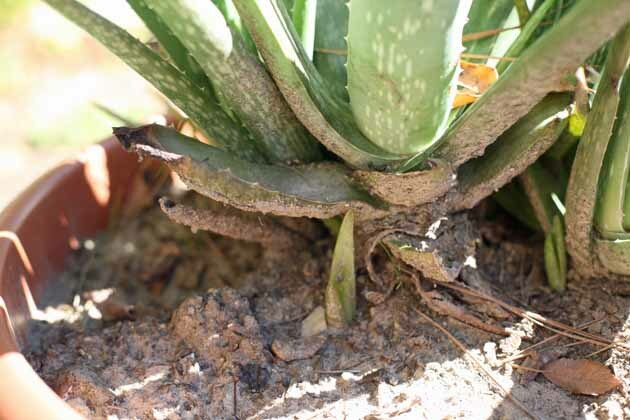 Aloe vera is not picky at all when it comes to soil. 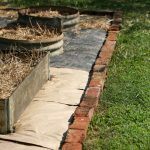 As long as you have decent garden soil it will have no problem growing. If your soil is heavy clay, you can mix it up with cactus and succulent soil mix like this one. Outdoor/Indoor – in gardening zones 1-8 you’ll have to plant your aloe vera in a container that you can move indoors before the first frost. Again, you can use cactus and succulent potting mix or you can use a regular potting mix or even some soil from your garden. You don’t need a very deep container since aloe vera is pretty shallow rooted. however, if you want to allow your plant to spread, make sure to choose a wide container. Also, make sure you choose a container that allows for good drainage. 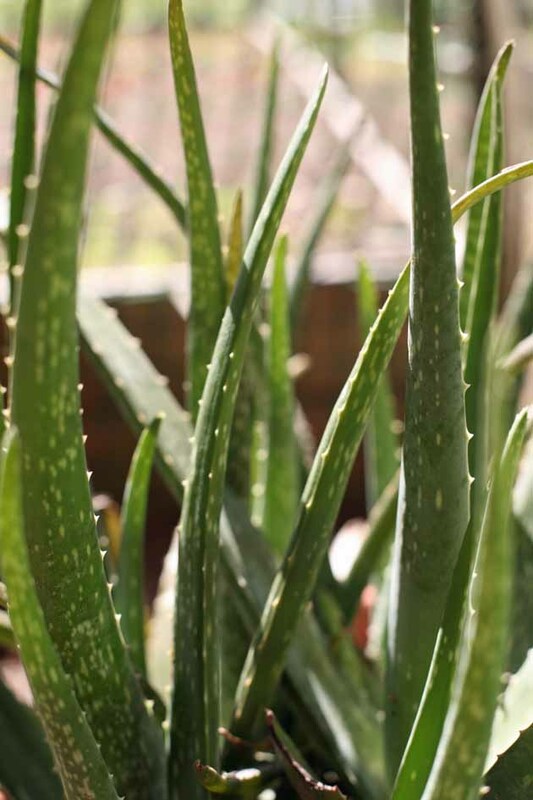 Note – you might think that aloe vera can handle full sun, and it might if it’s not too hot. But in areas that experience high heat during summer days, it’s better to plant aloe vera or place the pot in a partially shaded outdoor location. Here, in NC (zone 7b) if I leave my aloe vera in full sun in July or August (temperatures are around 100F), it becomes brown and starts to wilt (no matter how much I water it). This was a surprise for me because aloe vera is a succulent and should be able to handle sun. I also see it in my home country, Israel, growing wild in full sun all the time, but for some reason, it did better for me in a half-shaded spot. Maybe it depends on the humidity. Anyway, keep an eye on your plant and move it to half shade if it can’t handle the sun. Indoor – Aloe Vera is a great houseplant. If you can provide it with 6 to 8 hours of bright light a day, it will be very happy staying indoors. A sun room is a great location for an aloe vera plant or maybe a south-facing window. If there is no such location in your home, but you would like to keep your aloe vera indoors, you can supplement with grow lights. Aloe Vera is pest resistant, drought tolerant, and doesn’t require any fertilizing (although it doesn’t hurt to fertilize it once a year). It’s the easiest plant in the world to care for. Watering – I water my aloe vera plant twice a year (maybe). Here, in NC we have a lot of rain in the spring and summer, so when it is outdoors I don’t water at all. I bring it inside at the end of October and from that time until the beginning of April I water it twice. You should water it thoroughly, and then let the soil completely dry before you water again. Removing offsets – if your pot is becoming too crowded, or if you would like to give an aloe vera plant to a friend (it’s a great gift! ), you can remove some of the offsets. It is better to remove the ones from the sides of the container and not mess with the center of the plant. Wait until the offset is at least two inches tall (five or six inches is even better). 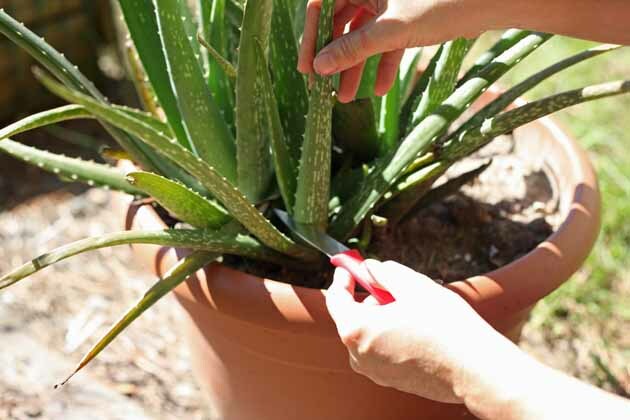 Then, to separate an offset, remove the aloe vera plant from the pot. Brush away as much soil as you can and locate the place where the offset is connected to the parent plant. Cut if off right there, it should have a few roots. Replant the mother plant in its pot, it might be a good time to add new soil and refresh things a bit. Then, plant the offset in its own pot and you are done. Make sure to place the plants in a well-lit location but away from direct sun. Protecting from the cold – above you can see a leaf that is becoming brown and starting to wilt. This happened because I left my aloe vera outside when night temperatures dropped to 32F. This will also happen if you leave your aloe vera plant in full sun on very hot days. So remember to pay attention to the weather forecast, and when it gets too cold, bring your plant indoors and place it close to a sunny window. Aloe Vera is very forgiving, though… Even if your whole plant has wilted, it will most likely bounce right back when conditions are right. It’s very hard to kill this plant. See this goodness that is coming out of the leave? This is what you want to use. 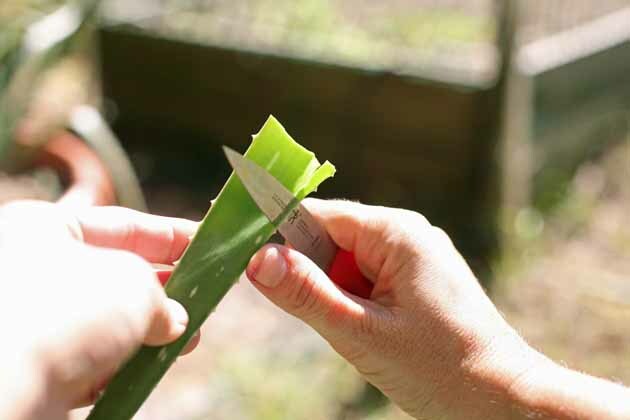 Then peel the front of the leaf off to allow you better access to the gel inside. See this gel inside of the leaf? This is the part we want to use. 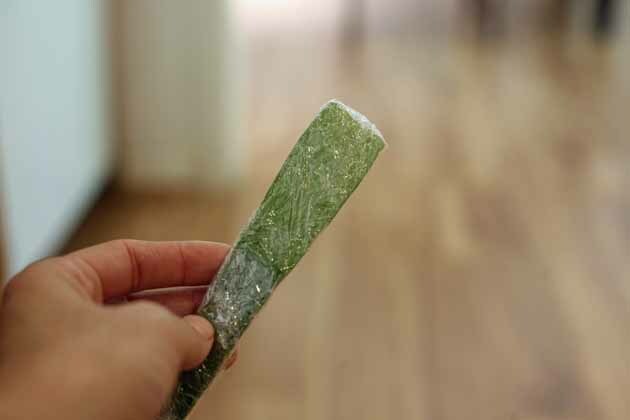 Next, we are going to talk about aloe vera uses, but just so you know, you can wrap the leaf in plastic wrap and keep it in the refrigerator for next time. When you need it again, unwrap it, peel another piece and use it. Don’t throw it away if you didn’t use all of it the first time. Aloe produces two substances that we can use as medicine. 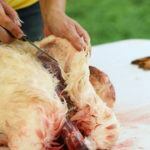 The gel is clear and comes from the inner part of the leaf, and the latex which is yellow and is found right under the skin (you’ll notice it when you cut the leaf). 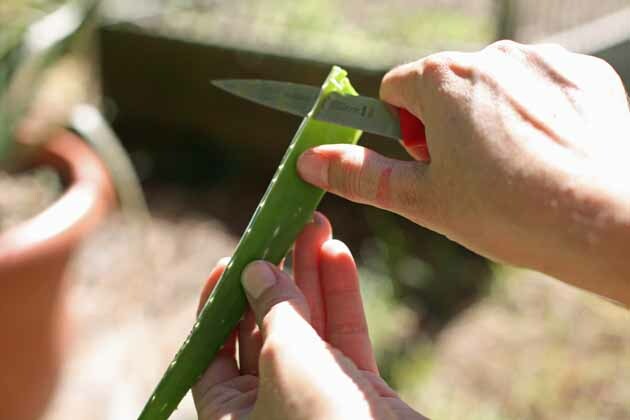 There are two main ways to use aloe vera: externally and internally. Externally – Both the gel and the latex are used externally to heal skin problems, support healthy mouth and teeth and healthy hair and scalp. Itchy skin due to insect bites. Skin damage due to frostbite. Reverse wrinkles and treat signs of skin aging. Strengthen teeth (use toothpaste with aloe vera in it). Fight dandruff by massaging into the scalp. Internally – aloe vera is used internally mainly by drinking aloe vera juice. 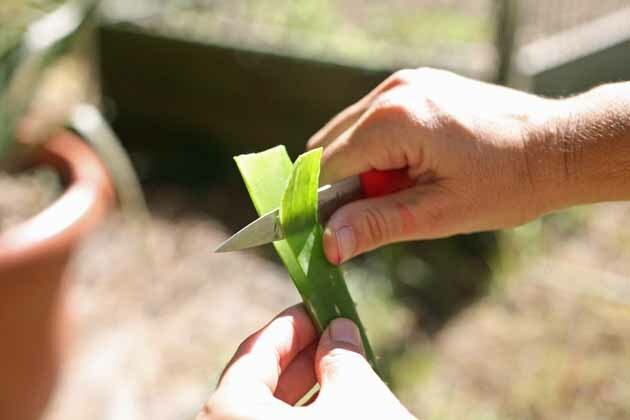 To make aloe vera juice from your plant, peel a piece of leaf, so you are left with only the gel (the inner, clear part of the leaf). 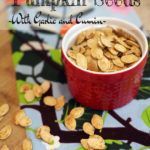 Add this to a blender with a cup or two of orange juice or mango juice (or whatever else you like), blend well and drink. Treat indigestion and constipation and support a healthy digestive system (therefore, aloe vera can help with weight loss). Treat arthritis and relieve joint pain. Treat UTI and prostate problems. Reduces cholesterol and supports a healthy heart. Helps to reduce and treat inflammation and infection of the eye and year. Improve the look and health of the skin. Help keep body balance between acidity and alkalinity (aloe vera is alkaline). I probably forgot a few things in the list above, but you get the point. Aloe Vera is an amazing medicinal plant that has been used for thousands of years. And fortunately, it’s very easy to grow. I keep my aloe vera in a pot so I can bring it inside to protect it from the cold but also so I can take it with me if we move. I’m not going anywhere without it! Do you grow aloe vera? What do you use it most for? Lee, I love my Aloe plant. I’ve had it about 4 years now. It was pitiful looking when I got it, in hard packed dirt and about 4″ tall. That sucker keeps on getting bigger and bigger and we keep separating the babies and putting mama in a bigger pot. In the summer months it (they) sits on my front porch. This year two of mine have the flower stem and it’s about 3′ tall on the original mama plant. I burned my arm and hand making jelly this year and as soon as I could turn loose I went and cut a piece from the plant and applied the gel to the burns. Wow, withing 10 minutes all the burning and stinging was gone. You could still see the burn marks for two or three days, but there was no more pain. It was worth the trouble of shuffling it in and out at each season for that one use. I am a believer! It’s magical! Yesterday my husband got a hiccup attack. I say attack because when he starts with the hiccups it lasts three days usually. He starts feeling sick and like he is going to vomit. He gets the heartburn real bad. Anyway, I peeled an aloe leaf, threw it in the blender with one pear I cut and a little bit of water. After drinking one-quarter of a cup he was as good as new. Did you ever try making juice from your aloe vera? Mine never grew a flower stem… I thought it was because of our humid weather her in NC, but now that you say yours grow a flower I am wondering if it depends on the variety of aloe vera and not weather conditions. Yes it flowered somewhat last year but we had it in a hanging basket so it grew horizontal, lol. This year it has grown straight up and has a new leafy aloe plant way up the stem. I would love to send you a picture of it. We keep the babies pulled out and potted separately and mama just keeps growing. We re-pot her a couple of times a year. She needs re-potting now. We also give ours more water. That is all we do different than your article states. It tells you what it wants and we know if it gets too much cold, too much sun or too much water and adjust accordingly. I’d love to see a picture of it! I agree, it’s a very forgiving plant. It tells you what it wants, that’s right. 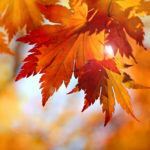 With other plants, you leave them outdoor and the temperatures drop during the night, there is nothing to save in the morning. 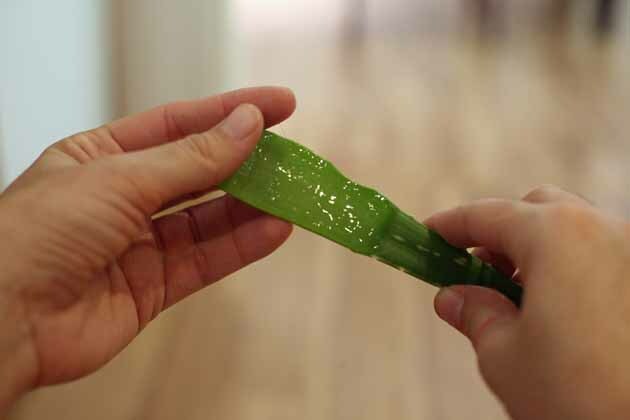 With aloe vera, you see it’s suffering, adjust, and it comes right back. I’d love to see pictures! You can send them to my email if you have time. lee (at) ladyleeshome.com. I planted some aloe vera plants in several pots. Watered them in and waited to watch them grow. Almost all of them have died. I guess too much water. I have pulled out the distressed leaves and am still trying to get the others to grow. They do not get too much light. Maybe this is the problem, Any help for the ones left? I really want these to grow. Help appreciated. Is it indoor or outdoor right now? It would be in a warm location (at least room temperature), so if it is outside and it’s cold, bring it inside. Not too much water. Only a little bit every couple of weeks. If you can’t find a place in the house close to a window that gets 5 or so hours of sun in the winter, then you should place a lamp close to the plant and keep it on for a few hours a day. Let me know how it’s doing. I love my little aloe plant. I heard it’s great to have indoors because it improves air quality. That’s why I got one when I lived in a basement apartment and it was a bit stuffy down there. Unfortunately that one died because I didn’t know how to take care of it. I think I watered it too much and it didn’t get enough light. Now since we’ve moved into a house, I got another one and it has been going strong for a few months now! I can’t wait until it grows and I can separate out the “babies” for even more plants! Its also great for minimizing the appearance of scars! It wont have a huge effect on old scars but it helps fade scars that are less than 2 yrs old. It is great inside and is one of the best plants for improving air quality by removing formaldehyde from the air. Just about the only thing to kill this plant is too much water and lack of sunshine. Always give it more sun and less water than you think it needs. I have many many plants here in AZ where it is practically a weed. You cant get rid of it! We have a very dry climate, little to no rainfall and clay like soil. Mimic as much of the desert environment as you can and you will have more plants than you know what to do with. Great info! Thanks for sharing. We have too much rain here in NC. I have to monitor my plant and sometimes bring it inside even during the summer because it’s too rainy. You are right, too much water is pretty much the only thing that will kill this plant! I have 6 plants of aloe plant in my house sitting on a couple of window sills. But it never did flower for me. Have mother inlaw plant and that did flower for me. when my mother was alive she had said it never did blossom for her and she had a lot of plants in her house. So I must have had some thing special. that was neat. I have mine for a few years now and it never flowered either. Maybe it’s just certain verities or maybe the weather we have is ok for the aloe vera to grow but not to flower. My family has used Aloe since I can remember. We used to cal it “burn plant” when I was young and had no idea it had a “real” name. I have a plant that is probably 60 + years old. My Mom had it before I was born. I use it any time I get a burn or any other skin ailments. It is very hardy and I rarely water it. I separated the main plant not too long ago and now have 5 pots filled with this wonderful plant. Every household should have one! Wow! 60 years old. Thant’s amazing. Are your plants in pots? Do you change the soil in the pots? I have to separate mine soon. Absolutely a requirement if there is a teen with acne. My daughter got a huge painful acne eruption two days before an important formal dance. She applied fresh aloe gel and it almost disappeared by dance time. I use it for sunburn and i use it on my dogs too. I never used it on dogs but I am sure it works just as it is on people. 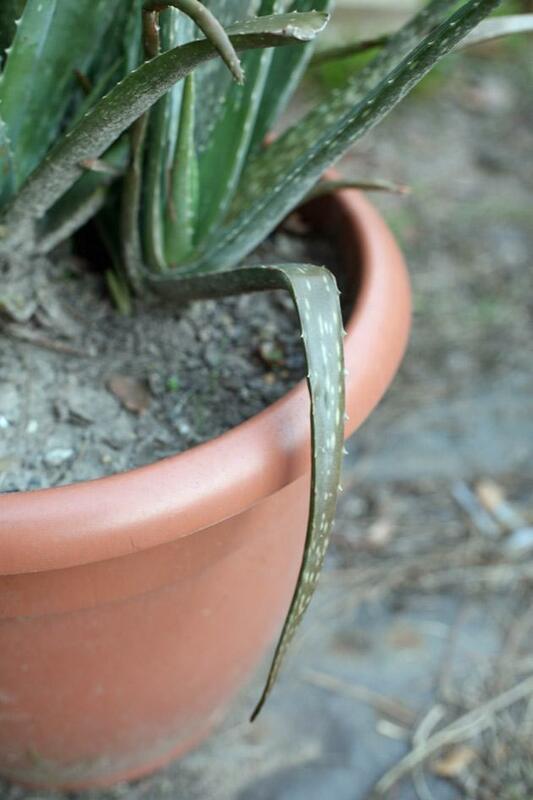 Sheila, the gray wilted looking aloe vera is usually caused by too much watering. How often do you water it? Also, it’s ok that it is indoors but it should be placed by a window. Maybe it doesn’t get enough light, or strong enough light, or heat. If it’s above 75F outside, place it on the porch. You are looking for a spot that has partial sun. If it is outside, make sure it doesn’t get too much rain. I have pics of what it looked like when i first got the plant & how it looks now (after I removed it from the original nursery pot). I can’t figure out how to attach the pics while replying to you from this site using my mobile phone. Can I send to you directly to an email address? We moved into this house in a retirement village last year, and found six Aloe vera’s in a neclected condition as die previous owner fell ill and could not care for her garden anymore. I transplanted them to the same area of the garden and some of them already flowered last season. Here, where we live in the Eastern Cape in South Africa, it is a sight to see when driving through the mountains when the Aloe’s are blooming. The flowers are mostly red with yellow on each flower. They also flourish between the shrubs alongside the beaches. Oh, I am sure it’s amazing. And what a blessing to have aloe vera everywhere for everyone to use. If you ever get a chance, please send me a picture. Thank you for sharing. Yes I do have aloe vera plants. I mainly use it on my scalp after bath to grow hair but I didn’t know of its other uses although someone said it’s good for arthritis too. I am from the Philippines so the weather is mostly humid and tropical. My mom and I grew a garden in our terrace, but the plants are mostly in pots. Among the first plants that we got was an aloe vera plant. It grew plenty over the years and I kept on tranferring baby off shoots into new pots to grow. The mother plant started flowering some years ago and her baby plants flowered as well in the succeeding years. The more I give then away to family and friends as gifts, the more they double in quantity. We probably have hundreds of aloe vera plants in our garden now plus the ones we already gave away. 🙂 we uses them for skin and hair care, but now I know I could make them into juice. That is awesome, Charms. I need to repot mine. My boy decided to “fix” it and cut half of the plant… Since then it is having a hard time recovering. I need to give it some attention. Wow, I never knew there were so many uses for Aloe Vera! We have always had it on hand for sun burn. My main plant is in full sun, in northern Australia, and it flowered a few months ago, pale pinkish flowers. I have never before seen an Aloe plant flower, so I felt quite special! It will be interesting to see how it goes during ‘The Wet’ (monsoonal rain season), it lives in a garden bed with good drainage, so I’ve got my fingers crossed it makes it through till next year! Thankyou for all the great ideas, I’m especially keen to try the juice! Keep an eye on it during the rainy season. You might need to dig it up, pot it, and bring it indoors if it can’t handle the rain. 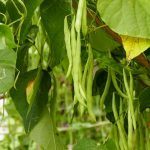 I have really enjoyed this post and reading all the comments about this amazing plant. I live in Central Queensland, Australia, and I got my first 2 plants from my Dad’s garden. He always said they are good for sunburn and other things but he had no idea of their other uses. Since I planted mine around 3 years ago I have had countless “pups” (babies). I replanted them all in a garden bed and now they are all producing “pups”. It was only last week I threw out the original adult plants because they had flowered twice (once each year) and were looking sad so I thought they must be at the end of there life! You can image how I’m feeling after reading how old one lady has had hers for 60 years! My plants have thrived (in the garden bed) through our summers raining season and 2 cyclones! We also have clay soil which tends to hold water as well, so maybe we are just very blessed ours do so well! I just wanted to say thank you so much for this info, I’m certainly going to be trying some new things with Aloe. Hi Joanne! Thanks for stopping by. This plant is truly amazing. Lots of uses! I am really bad at keeping plants alive, but when it comes to keeping aloe I’m a pro! LOL! I didn’t water mine once since I brought it inside for the winter a month and a half ago. I should do water it. Thank you for taking the time to write this, April. Please keep me updated. The Aloe juice is not super tasty, but very healthy for your gut. My son grabbed a saw from the shed a few months back and “fixed” the plant. LOL. I wanted to strangle the boy. But the plant is recovering, thanks god! I live in las vegas and I must say I have to water my plants year round. But then again we are in a desert. I got my first one from a neighbor and now I have so many I don’t know what to do with them. I can’t put them in the ground because they spread too much so i have them in large pots. I notice that if i dont water them then they turn the gray color you all are talking about… so then I just over water the pot and BAMB they bounce back and before I know it more babies show up its a great way to get them to shoot off offspring. As far as flowering mine never has. Someone told me only male plants flower.. Have any of you all heard this? uses bug bites, sunburn and added it to all kinds of smoothies and really helps with arthritis pain. You are in a perfect location to grow Aloe vera. I didn’t know that only the males produce flowers. This explains a lot. You should look for a farmer’s market and go a couple of days a year to sell your extra plants. Spread the aloe vera love! I have read that aloe vera plants may be toxic to cats. Have you heard this? Besides keeping the plant outdoors in the summer, do you have any suggestions for the winter months and keeping the plant seperated from cats roaming the house? I have a cat and never had a problem with her being close to the aloe vera. When I did the research for this post I didn’t see it mentioned anywhere. Also, animals are very smart when it comes to what they should and shouldn’t mess with. If it’s not a good plant for your cat, I am sure she will stay away. You will have to bring the plant inside for the winter, but if you are worried about the cat, you can always keep it on a shelf somewhere in a place that is out of the cat’s way. As far as I know, yes. But you might want to read specifically on the variety you grow. Hello, I want to know if the green “skin” of the aloe vera stalks can be use. and if so, how? I don’t think you can use them… In all my research and years of growing aloe vera, I never heard of them being used for anything. I ABSOLUTELY LOVE my aleo plant I got it off my friend who’s mother had almost 40 Huge aleo plants in the front windows of their store, these plant are over 20 years old and gorgeous, so I told him id love one for my birthday. And he gave me one, I’ve had a huge flower come out for the last 3yrs I’ve had it. One of the leaves ( I guess that’s what their called)are as long as long my arm, its awsome i get complements on it all the time. It sounds really awesome! It is such a great plant. I am going to repot mine this year. It has been in the same pot for the last 7 years or so, I think it deserves fresh soil. Thanks for stopping by! You’ll enjoy it so much, I promise! Thanks for stopping by. Thanks for for your great explanation of Aloe Vera care & use. I am from the Tropical Islands of the South West Pacific. Vanuatu, the island of Espiritu Santo. One of the US Base during the WW2. It does work! I love this plant. I am now visiting family in Isreal which has a dessert kind of weather and it grows here wild everywhere. It is such an amazing resource. I live in Maryland in zone 7b, where we have lots of rain in the spring and fall. I received my aloe vera from my late mother years ago, and have given away several babies. I keep mine outdoors from April to October. I place its pot under the eaves on the sunny south side of the house, where it gets a little water but not much. After having the plant for about 7 years, it bloomed for the first time last year! I live in NC. Same zone so same weather conditions. I do the same like you but mine never flowered yet. Thanks for this informative post! You answered all of my questions. I have always kept a small aloe vera in my kitchen for burns. We recently moved from Virginia to Texas and just couldn’t bring all of our plants. My lungs have been damaged due to an autoimmune disease and a healthcare worker suggested aloe vera for the bedroom. It produces oxygen at night also scrubbing the air of benzene and formaldehyde! In Texas, the aloe vera plants are huge and of course, we are in a different zone now too. Today we hit the nursery and bought a bunch of them for inside and out. Aloe vera is such a bargain when it comes to your health. Texas is just the place for aloe vera. Here in NC I feel like the plant is struggling sometimes. It’s too humid for it. I hope it will help you feel better! I use the aloe vera plant mostly for skin issues. I use an essential oil blend that opens the airways and supports a healthy respiratory system at night. I put it in the diffuser right close to my head and it helps me breathe better and therefore sleep better. I’ll be happy to share more info if you are interested. And you are right! 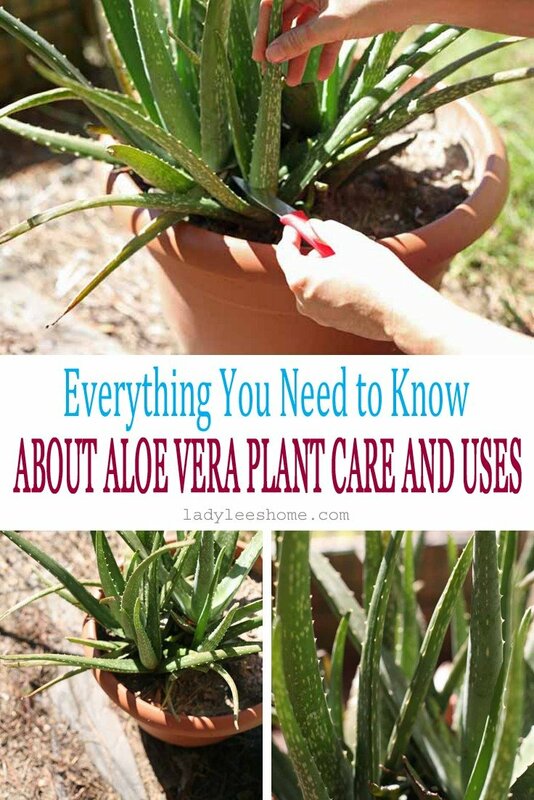 Aloe vera has so many uses and it’s so easy to grow, it is a bargain! It’s fine! It should be watery, only when they sell it at the store they make it into a gel so it’s easier for people to apply it. I just read all the posts and couldn’t find how much aloe for drinking — in an 8 oz. glass? I have stomach problems and this may be the answer. Also, how do you use it on the scalp? I have psoriasis and maybe it could help. I just got a sprig of aloe from my daughter-in-law and it is hanging over the edge of the pot, not upright. It has been struggling to survive, so I’m glad to know that I may be watering it too much. Thanks for encouraging me about this plant. It might take it a bit of time to establish and root. Just make sure it’s in a warm place. I water mine through the summer once every couple of weeks with a couple of cups of water. I think your plant is smaller so you probably need much less. You can just spread the gell anywhere you want. I’ll be happy to help you with your skin problems with essential oils as well. If you want to talk about that just email me to lee (at) ladyleeshome.com. This is such a great guide! I had an aloe vera plant that I tried to use and keep alive, but I sadly failed. I am saving this guide for down the road when I purchase another one. This is incredibly helpful! Thank you so much for sharing not only how to care for it, but also how to use this versatile plant! About 10 years ago I bought an Aloe plant from a store that was closing. I put it next to some other house plants in my bedroom. After a while it looked like it was going to die so I just threw it in the back cellar by a window and forgot about it. One day I was looking for something or other and went into the back cellar started searching when I looked up at the shelf by the window I jumped back in fright. I seen something out of the corner of my that didn’t belong. I thought it might be a snake or something. It was the Aloe plant that had grown and sprouted to about 14″,….I was amazed. Since then I’ve cultivated hundreds. They are just great practically no care and here in Northeast Pennsylvania they thrive summer and winter with temps in my cellar from 80’s in the summer and down in the 50’s in winter. They seem to be very happy and so am I. Great site Lee, keep up the good work. What a great story! Thanks for sharing this. It really is a low maintenance plant! Fantastic article! We sell our families organic aloe Vera on our website vey affordable. You also receive an adoption certificate.